At Powershop, we love data. We think it’s a great tool for customers to track and manage their power usage so they can not only save money but also change their usage habits and do the right thing for the environment. For this reason, we’re always working hard to find interesting ways to present data that are accurate, simple and pretty! You may or may not be aware that your Powershop mobile app and online usage tools allow you to track data on a half-hourly, daily and monthly basis. This functionality can help you stay on top of your usage and help determine and isolate what power-hungry devices are gobbling up your power. But there’s more you can do if you’re the curious kind and enjoy digging a bit deeper, like understanding what your usage Heatmap actually says. In your online account, if you go to Usage then Usage Patterns, you can see your power usage in the form of a Heatmap, which as you can see (below) looks like an 8-bit dystopian impressionist painting. Whether Van Gogh would make any artistic sense of it is a separate discussion, but for Johan and many customers like him, this rectangular block provides meaningful insights about their usage. The Heatmap represents power used as half-hourly blocks (1 day is equal to 1 row of 48 blocks) in a colour scale ranging from dark blue (low usage) to white (heavy usage). Tip: Hovering the mouse pointer over a block reveals the exact amount of power used during the relevant half-hour. Learning to read Heatmaps can be a bit like acquiring a new language — challenging and very exciting at the same time. With a bit of practice and help from the Powershop community (if you need any), you’ll be identifying your own habits or the consumption patterns of power-hungry appliances and can take action to lower your usage with little effort and, more than often, at no cost. Some of our wonderful employees have gladly shared their Heatmaps to help us illustrate the kind of insights you can derive from your very own Heatmap. 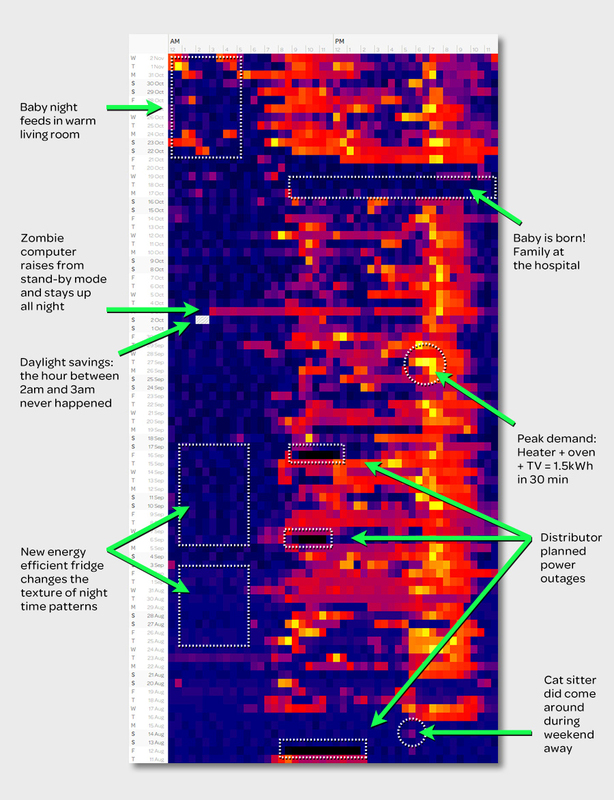 Thanks to the Heatmap below, our team member was able to identify the impact of replacing his old fridge with an energy efficient one, why his computer was acting weird at night, and whether his cat sitter was actually coming to his house while he was away, amongst many other things. Another member of our team regularly tracks the impact of his solar export and keeps an eye on when his solar PV system starts and stops using his Heatmap every day. Do you use any power at night? Are the spikes in usage caused by appliances on standby? Or is a heater running all night in your spare room? Is power used when no one is home? Could appliances be unplugged during these times? What time does peak usage usually happen? What activities or appliances occur or are used at this time? Are there significant differences between winter and spring patterns? Could draught proofing, increased insulation or a more efficient heater improve matters? Quite a few Powershop customers have already shared their Heatmap insights with us. What about you? 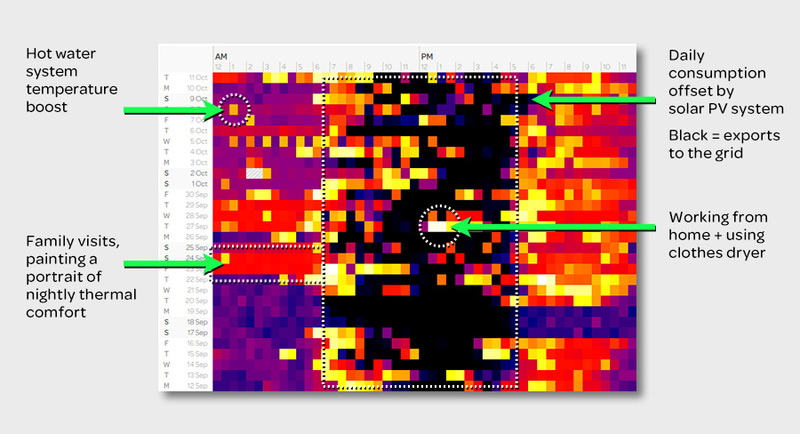 Have you noticed interesting patterns in your Heatmap? Identified a fault with an appliance? Quantified each cent your cousin owes you for his or her lengthy stay? Send us your best Heatmap stories to datastory@powershop.com.au or tweet them to us at @PowershopAus. We’ll compile the best stories in a follow-up blog post, encouraging others to similarly explore and make the most of their Heatmaps. Read next: Powershop is now available in South East Queensland!